This project aims at integrating AusCover remotely sensed datasets from MODerate resolution Imaging Spectrometer (MODIS) sensor with Himawari-8, Advanced Himawari Imager (AHI) datasets to study the feasibility of AHI sensor in deriving the land surface products—Land surface temperature (LST) and vegetation stress index across multiple spatial and temporal resolutions. AHI surface reflectance will also be produced and compared with AusCover MODIS 19-band and MOD09 17-band surface reflectance products. 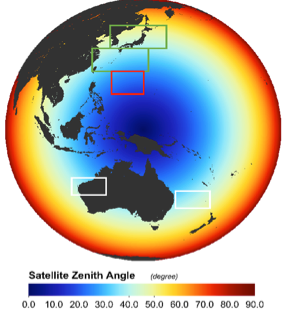 The spatial resolution of the AHI and number of spectral bands is arguably comparable to those of the MODIS sensors with 0.25, 0.5 and 1 km spatial resolution across 36 spectral bands (spanning 0.405 μm - 14.385 μm). As such, the AHI has great potential to deliver earth observation products similar to those currently derived from MODIS data. This is a work under progress. Results will be posted here when available for display.